When Caitlyn spotted the rhubarb at Wade's booth at opening day at our farmers' market three weeks ago (Eeek! Anyone else wondering where May is going in such a hurry?? ), she immediately requested rhubarb crisp. Naturally I bought too much rhubarb, forgetting that there was still a bag left in the freezer from last year. So, a festival of rhubarb! We've had crisp twice. I like rhubarb muffins, but I think Caitlyn will like them better if I roll the rhubarb pieces in sugar before folding them into the muffin batter. 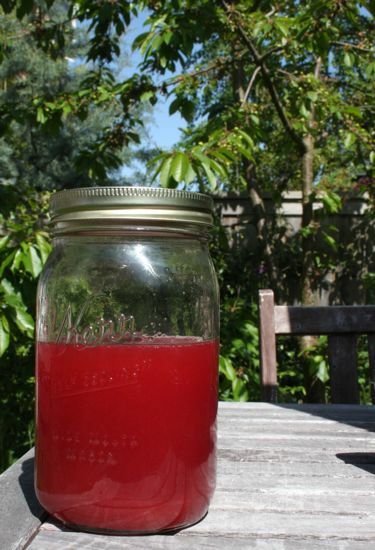 I made a batch of this awesome rhubarb and rosewater syrup. I don't know if I didn't boil it down long enough or if I was more thorough about straining out the juice (or maybe I was just a bit free with my interpretation of "1 pound rhubarb" and instead just used up the rhubarb from the freezer), but I got lots more than the recipe suggested I would. It would indeed be lovely on yogurt as suggested, or over pancakes or vanilla ice cream. Mostly, we've been drinking it. 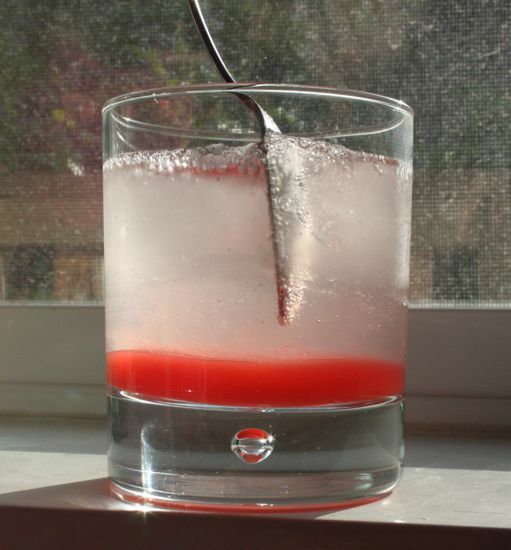 A finger worth of syrup, a couple of ice cubes, and club soda. A little sweet, a little tart, totally bubbly. It's worth it for the extremely silly faces Caitlyn makes when she drinks it. The one down side to making the syrup is the leftover rhubarb mush. I couldn't bear to throw it out. But it turns out that finding a recipe for something that includes rhubarb mush is harder than you'd think. Lots of crisps and cakes and muffins, but all the ones I found assumed you had raw rhubarb chunks. It came out dense. Moist, but dense. I blamed the Sun Oven (the oven didn't quite make it to 300 degrees) and since there was still more rhubarb mush, I tried again. Same recipe, roughly the same amount of mush, with an added teaspoon of baking powder. The batter looked right when it went into the oven - a lot like most any other cake batter. I baked this second version inside. And pretty much got the same thing. It's not really a cake. It holds it's cake shape, but it's dense and moist, kinda like a very stiff pudding. It's tasty, but it's a bit strange. So, maybe a different cake recipe to start from? More leavening? More eggs? 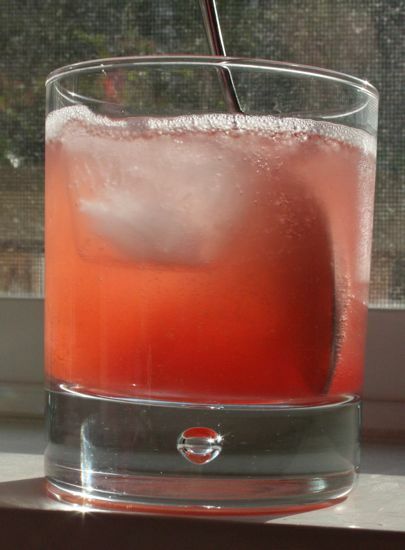 Because I might make that syrup again and then I'll have rhubarb mush to put somewhere. But I think I'll stick with crisp for the rest of this season. I had a look at the recipe and I think, just based on gut feeling, that you'd need more flour in there to balance out the wetness of the mush compared to the chunks of rhubarb called for. The fact that more baking powder didn't have much effect also suggests there isn't enough structure to trap the bubbles, hence the dense ness. I bet it tasted great though, and the colour must have been glorious! I think I'll go and see what there is by way of rhubarb in the garden now! I didn't go with more flour since the consistency of the batter was already about where I'd expect it to be. Ian's suggested that I look for a rhubarb pudding recipe next time. Since the cake came out a bit pudding-y, might as well just finish going in that direction.